November marked one year since PR executive Peter Shankman launched his free “Help a Reporter Out” (HARO) service. What a year it’s been for something that started out as a simple favor for Shankman’s friends and contacts in the media who were looking to connect quickly and easily with a wide array of sources. When Ragan.com first checked in on HARO last April, Shankman, who also is the CEO for New York PR firm The Geek Factory, had recently moved the service from its Facebook page, which could no longer handle the e-mail traffic, to its new home at www.helpareporter.com. His distribution list grew to 3,000 people and he was sending out HARO e-mails once or twice a day. As of mid-October HARO’s distribution list had ballooned to 36,000 members, who range from TV reporters to PR professionals to industry experts to business entrepreneurs looking for a little publicity. Shankman was predicting HARO’s membership would reach 40,000 by the end of 2008, and he already had advertising lined up for the remainder of the year. Shankman’s success and the tremendous growth of HARO are not terribly shocking, perhaps, given that today’s media machine is churning out content 24/7. That means new and interesting sources and experts to interview are always in demand. HARO’s tagline is “Everyone’s an expert at something,” and to be sure, people have not been shy about sharing their expertise and gaining some exposure while, of course, helping a reporter out in the process. Hear how two PR pros have benefited from Help a Reporter Out. Fashion model and pest extermination business owner, Genma Stringer Holmes, of Nashville, Tenn.—yes, she really is both, as well as a writer and public speaker—is a big fan of HARO. Holmes’ recent HARO-related opportunities include speaking engagements for Essence magazine and Howard University. Carla Caccavale Reynolds, a partner with New York-based PR firm Quinn & Co., says HARO has been a useful resource for her agency, not just for connecting with the media but also for some recent free advertising. “In the HARO e-mail he sent out on the Friday before Labor Day, he mentioned that luncheon and our agency in his intro. After that our Web traffic went through the roof, which I thought was pretty amazing considering it was a holiday weekend,” recalls Reynolds. And like Holmes, Reynolds says she finds the “personality” Shankman brings to the HARO service appealing. Both Holmes and Reynolds also have experience using PR Newswire’s ProfNet service, HARO’S biggest competitor. Reynolds said that while her agency still subscribes to ProfNet, she did recently discuss cancellation options with the company. She says she was taken aback by the ProfNet representative’s response. Holmes says she had a similar conversation with a ProfNet representative who questioned HARO’s quality when she recently canceled her ProfNet subscription. She says she told the individual that she felt the leads she has been getting with HARO have been more useful to her, and after evaluating both options “did not see the value” in continuing with the paid service. Holmes said she also offered to send the ProfNet rep examples of the coverage she has received because of HARO leads. And as for the price, Skinner says, “We think our service is worth every nickel,” adding that ProfNet offers its users a variety of products and subscription rates. However, he says he is not going to start seriously weighing any offers until early next year. And whatever he does decide to do next with HARO, he insists he will remain involved. He also says that as long as he owns HARO, he will “never charge a penny” for the service. Shankman does admit, however, that running HARO has become time-consuming. “I need to plan my life, including my air travel, around these e-mails, which gets crazy,” he says. At any rate, I sent Peter some glycerin soap and butter bars for a giveaway. Wow! I had almost 3 times as many hits as normal that day when Soapourri was mentioned. He made it fun, too - he asked what people's favorite smells are, and then awarded the prizes to the ones he chose. Many people accidentally sent their picks to me - the most common was "the smell of my baby's head". AWWWW. The winners were - you won't believe - bacon, puppies, and Fenway Park! Anyway, THANKS PETER, for the mention! Thank you to Peekaboopicks.com for the following article! You come home from work, slip off your shoes and drop the mail on the counter. Now what? Settle on the couch? Flip on the news? Not in my house. I’ve got a daughter clamoring for something to eat, a dog who needs to go out after a long day cooped up and a husband who has just walked in the doors himself. Chances are, I won’t be sitting down for another hour to an hour and a half. We want help, we really do. But when’s the last time you felt like anyone else did it just as good? A study published a few years ago in the Journal of Marriage and Family confirmed – moms are just as stressed at home as they are at work. Then there’s the Harvard University study that says we’re, ummmm, stressing out our spouses too. So what’s a busy girl to do? How about a little retail therapy? I said a little – I’m not advocating you shop your way out of the doldrums, especially in this economy! But a little mad money shoved aside each paycheck can make our lives that much less maddening. And if less stress for us means less stress for him, let’s just say it’s an investment in your family’s future, shall we? Favorite Letter Dainty necklaces from Homespun City is just the right kind of Mommy jewelry. The hand made, hand stamped charm is just as the name implies – a dainty reminder of your special little someone hanging round your neck all day. Artist Catie Baumer (who says she’s not a mom . . . yet) creates these one-of-a-kind pieces to add a bit of feminine flair that’s not over the top. You pick the initial, and she engraves it. Only you have to know who it’s for – perfect Mommy jewelry for business or pleasure. Moms with little ones who are still grabby beware - these are dainty by name and dainty by nature! For added stress relief, pick up a Calm Flower Necklace. With prices no higher than $32, this is a store where mamas can buy without breaking the piggybank. The girls in the office are all salivating over the newest member of Ju-Ju-Be’s bag line, the Be Light. I’ll tell you what they’ll never guess – it’s a diaper bag. Yup, the funky orange and blue flowered bag that alone weighs barely more than my iPod is Ju-Ju-Be’s newest mom bag, but the 19-year-old in the office still wants one. With a 3-year-old, I don’t need to haul her entire nursery everywhere I go, but I still love the extra compartments – not to mention the Teflon coating that will protect my cell phone and iPod when she spills a bottle of juice in the backseat of the car. Even better it’s just $35! Surf on over to Mamas and Munchkins for the Be Light and check out the rest of mama on the move Teri’s goodies. Ju-Ju-Be will be giving away a new bag from their line every week this year to moms who need a little bit of love to sling over their shoulder. Check out their Bag a Week Giveaway each week and make a post on the top of the week. You might win – or you might just meet some other cool moms. Their “pink room” is a great place to dish, another good stress reliever for mamas! Of course the ultimate in stress relief is a long, hot relaxing bath. Hahahaha. Remember those moms? I don’t think I’ve been alone in my bathroom since 2003 BK/D – that’s before kid and dog. On the rare occasion when I sneak in a little soak, I confess I’ve taken to stealing Jillian’s bubbles for my scrub in the tub. Little Twig’s Tangerine Bubble Bath is organic and loaded with Vitamin E and aloe – because it’s supposed to help baby’s skin. But it smells so delish I just can’t resist! I’m not completely selfish – I leave Jilly’s bumblebee bath mitt for buzzing around the bubbles only when she’s in the tub. Although I will say it’s tempting . . . The wallet damage? $16.49 – pricey for a bubble bath, but soooo worth it. Of course bubble bath only works for the bath, so in the absence of tub time I make do with the Add-a-Tubes from Soapourri. These simple scented soaps are a soothing glycerin, and each one slips into the long-lasting scrub bag so they won’t slip out of your hands and down the drain. The suction hook for the bag ensures this is a Mommy pleasure that can be hung high above the hands of little monkeys who always want to try Mommy’s stuff. Before you get shopping, how about a few stress relievers of your own? Leave them in comments! We got mentioned on The Green Parent! Here is a link to the article. Mine is at the bottom! honor mom and give back to the planet. Bamboo Knit Loungewear: Tell mom it's time to relax with some bamboo loungewear from The Company Store that is grown without pesticides or chemicals, and is 100% biodegradable. Callie Micks Recycled Apron: Show mom she's your top chef with a super sassy, eco-savvy apron made from recycled fabric in downtown LA. Lotuspad Eco-Friendly Yoga Mats: Help mom find some Zen with a PVC-free, non-toxic yoga mat. 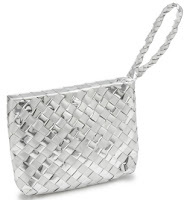 Recycled Silver Juice Pack Clutch Bag: Give mom some glam with this chic clutch made from recycled juice pouches! Lucina Berry Coil Bracelet: This stunning bracelet combines red choclo seeds from Colombia with fair trade silver beads strung on an interior coil made from recycled Colombian pesos. Vintage Record Cover Journal: Mom will love a rocking journal from Papergeist books. Each book is made from post-consumer waste paper and a vintage record cover of your choosing! My Mother's Day Gift Box: Help mom wipe that carbon footprint off of her face with this stylish gift box filled with a butter bar and souffle made from fair trade shea butter and an assortment of hypoallergenic soaps that use vegetable glycerin instead of petroleum. I got an email on Sunday from a guy in L.A. who works for a company specializing in gifting events for celebrities. He wanted to know if I could participate in gift bags for their gifting lounge for the Oscars. I thought about it for awhile, then decided to go for it. The problem was, he needed it in a week, and I needed 100! I brainstormed for awhile, then decided to showcase Add-A-Tubes. Below is a picture of the bag that we did. We put in a soap sack, and a shrinkwrapped bundle of 5 'tubes, along with business cards, coupons, and a hook. So I decided this on Monday and stuffed the bags with the soap sacks that day. The next morning I woke up and thought "OMG, Fedex takes forever to get to California!" I looked it up - he needed it by Monday the 18th. I realized that I had to ship it that day (Tuesday) for it to get there on time. I didn't think I could do it but I did. I was absolutely exhausted and couldn't have done it without my kids, who helped after school. I made it to Fedex Kinko's with a 42 pound box with 20 minutes to spare! Here is what 100 of them look like! I think I will use these as a way to package Add-A-Tubes for gifts on the site. Look for it! Who'da Thunk It? Eyeball Soaps on Good Morning America! It was so very exciting to find out last week that my eyeball soap had appeared on Good Morning America! Michelle Madhok, of Shefinds.com and Momfinds.com did a ten minute segment with Heidi Jones and talked about how to get rid of germs during flu season. She introduced different hand sanitizers, then liquid washes, and then talked about getting your kids to wash by using "fun" soaps. Click here to see the video at ABCNews.com. Also, here is a link to Momfinds.com where you can see the details of all the products that Michelle mentioned. I feel very lucky to have had our Christmas duckies chosen for Lena's Notebook Holiday Gift Guide - here is the link. Thank you, Lena! Soapourri's eyeball soaps are featured on page 14 of this month's Halloween celebrations, a Woman's Day Special Interest Publication. Am I excited? You bet!!! Watch out! The eyeballs in these handcrafted glycerin soaps move. $6 each. 515-222-0144; www.soapourri.com. A couple of weeks ago, I got an email from someone that writes for a well-known national woman's magazine. She wanted a good picture of my eyeball soaps. Well, I tried and tried, but just couldn't get the quality needed for a magazine. In desperation, I turned to the photographer who did my photo for my "about" page. She did some beautiful pictures - here's one! Thank you, Michelle Gatton from MichelleGatton.com! We got a review from Desmoinesfamilies.com! Here is a nice review from a local web site for families - Des Moines Families.com - thanks, Kelly! 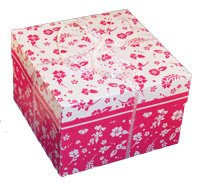 Mother's Day Gift Idea #1: A pink-and-white box brimming with natural, homemade Soapourri soaps and bath goodies. Contents include Amazing Grace soap (named after soap queen Cindy Helgason's mom), face pouf, inscribed oval soap, butter bar and whipped shea butter. Customize Her Ladyship's collection with a variety of scents to make it as unique as she is. WHERE TO BUY: $34.95. Visit www.Soapourri.com or call (515) 222-0144.